Brunnthal/Munich, Germany, July 5, 2017 – Simark Controls Ltd., a subsidiary of SFC Energy, leading provider of hybrid power solutions to the stationary and mobile power generation markets, announces the receipt of an order for fuel cell/solar hybrid EFOY ProTrailer mining communication trailers and EFOY ProCabinets by their wireless network partner 3D-P. A large end user in the Alberta Oilsands has deployed 16 of 3D-P’s hybrid EFOY ProTrailers and three autonomous EFOY ProCabinets, with an additional 12 trailers being delivered. Hybridization of SFC Energy’s EFOY Pro fuel cells with solar allows for significantly longer autonomy than battery banks powered by solar alone. In times with insufficient solar power output, the fuel cell automatically switches on, reducing costly downtime and maintenance intervals by avoiding the deep discharging of the battery. This power reliability significantly increases the trailer’s autonomy. Excess heat from the fuel cell is used to keep the insulated battery and electronic compartments warm. 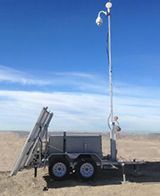 The 3D-P trailer can be easily and cost-effectively deployed anywhere in remote locations. 3D-P custom configures each unit for the customers’ specific load requirements and geographic locations. The Alberta Oilsands customer uses 3D-P’s mining trailers to quickly and cost-effectively provide communications to remote mining and oil & gas locations. The trailers simplify the customer’s network rollouts and flexible extension of wireless coverage as the mine’s footprint develops. All components are integrated into one unit to enable single easy deployment of both power and retractable radio masts. More information on the off grid power and automation portfolios of SFC Energy and Simark Control for security & safety, oil & gas, wind, traffic management, environmental and telecommunications applications at www.efoy-pro.com, www.sfc.com and www.simark.com. More information on 3D-P’s trailers at 3D-P Trailers. 3D-P designs and builds Intelligent endpoints for rugged industrial connectivity and creates application software that consolidates multiple systems on a single hardened technology platform. The Company’s value added, technology based, services and products allow customers to leverage existing investments with a single platform that provides a foundation for future technology implementation. Simark Controls Ltd., a company of SFC Energy AG, is a service oriented, value added sales company specializing in custom integrated and manufactured solutions of high quality instrumentation, automation, energy and power products. Simark provides instrumentation & measurement systems, power components & drives, security & surveillance equipment for the oil & gas industry and mining, forestry & community supply markets. The Company is headquartered in Calgary, Alberta, with sales offices in Edmonton and Grand Prairie, Alberta, Saskatoon, Saskatchewan, Vancouver, British Columbia and Montreal, Quebec. SFC Energy AG is a leading provider of hybrid solutions to the stationary and portable power generation markets. SFC is the number one supplier of fuel cells, with over 36,000 fuel cells sold to date. The Company has award-winning products and serves a range of applications in the Oil & Gas, Security & Industry and Consumer markets. The Company is headquartered in Brunnthal/Munich, Germany, operates production facilities in the Netherlands, Romania, and Canada, and sales offices in the U.S and Canada. SFC Energy AG is listed on the Deutsche Boerse Prime Standard (WKN: 756857 ISIN: DE0007568578).